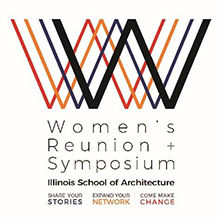 The School of Architecture at the University of Illinois at Urbana-Champaign invites you to join us on September 26-28, 2019 for a reunion and symposium for our alumnae. This two-day event will examine, celebrate, and recognize our alumnae through in architecture. Share your stories, journeys and work, inside architecture and out. Expand your network by connecting with our community of over 2000 graduates around the world. Let’s make change together by examining challenges and bringing visibility to issues for women in architecture. We are additionally excited to announce an exhibit featuring the work and stories of our alumnae at the Krannert Art Museum, which will open during the Illinois School of Architecture Women’s Reunion & Symposium. In preparation for the Reunion and Symposium, we will contact you to learn more about your activities since graduation. We hope you will respond to our survey so we can paint a detailed picture of the myriad paths of our alumnae. We look forward to you joining us in September! We are excited to announce an exhibit featuring the work and stories of our alumnae at the Krannert Art Museum which will open during the Illinois School of Architecture Women’s Reunion & Symposium. We need you to share what YOU have accomplished! Even if you are not able to attend the event, this is a great opportunity to feature your work in the curated exhibit. Work: Project work, design work, and any other work that represents your own contribution. We are inclusive of the many professional paths our graduates have taken. Student work and images/photos: Do you still have something from your time at Illinois? Photos of you and your classmates working in studio? Design projects from your first portfolio? An image of you. We want to make visible the faces of designers, architects, and our graduates. Please send us your professional headshot. Specific requirements are listed below for digital images. Submit the images or the link to a transfer folder to: arch-women@illinois.edu. For non-digital submissions, contact us at arch-women@illinois.edu. Please submit your materials by April 17, 2019 and we look forward to your participation! File format: Images in JPG or PNG format in CMYK, at a minimum of 300dpi. Line drawings should be submitted in PDF format. Large format images are welcome and encouraged. Please submit no more than 9 images per person. Non-architectural projects are welcome. 1. Alumnae name, professional title, and role on the project. 2. Name of the firm and office location. 3. Firm size (number of employees). 4. Project team (name of collaborators and their firms). 5. Project data (includes: project title, year of project design, year of project completion, project location address, UTM coordinates, city, state, region and country, square footage, cost per square foot, if known). 7. Summary of the project (300 words max). This may include: project intent, description of the project and project type, client, impact and/or recognition of the project. 8. Copyright and permission statement. Contributors are responsible for obtaining permission for images to be included in the exhibit. This includes images protected by copyright, such as images published elsewhere and pictures taken by professional photographers. Credit must be given to those that hold the intellectual property of the image and submitted along side the image. These images will be exhibited and publicly displayed during the 2019 University of Illinois Women’s Reunion & Symposium at the Krannert Art Museum. Submission of images here means that you agree with these terms. Note: Not all images will necessarily be included in the exhibit, but each person will be represented. File format: Images in JPG or PNG format in CMYK, at a minimum of 300dpi. Line drawings should be submitted in PDF format. Please submit no more than 5 images per person. File format: Images in JPG or PNG format in CMYK, at a minimum of 300dpi. This is expected to be in a square format similar to a portrait or professional headshot. The schedule and list of speakers are still being finalized. Below you will find an outline of events, including starting and closing times of the symposium. Something to consider when booking travel arrangements, the Chicago Architecture Biennial is opening on September 19, 2019 and runs through January 5, 2020. Opening reception for the Symposium Exhibit at the Krannert Art Museum. Optional campus and school tours will be available for those arriving early. This day includes an informal continental breakfast, opening speaker, and three work sessions featuring School of Architecture Alumnae. All-day Symposium Exhibit of women’s work at the Krannert Art Museum. Group dinner for all attendees in the Temple Buell Gallery. Morning session and closing speaker. Symposium will conclude around 12pm. Optional campus and school tours will be available in the afternoon. Visitors to Champaign-Urbana can fly through Willard Airport (CMI) in nearby Savoy, about 10 minutes from the campus of the University of Illinois. There are a handful of connecting flights offered daily from O'Hare Airport (ORD) in Chicago or Dallas-Fort Worth (DFW) Airport. We recommend booking your flight as soon as possible. Located in the heart of downtown Champaign, Illinois Terminal offers visitors a facility through which one can access intercity bus services, local mass transit, Amtrak trains, Greyhound, and taxis. Peoria Charter Coach Company also has several buses running between both Chicago airports and our campus, per day. Champaign-Urbana is conveniently located at the crossroads of Interstates I-57, I-74, and I-72, about a 2-3 hour drive from Chicago, Indianapolis, St. Louis, and Peoria. Uber and Lyft are available, as well as taxis. There is also a great public bus system, MTD, which connects the various transportation hubs with the hotels and campus. A standard ride costs $1, one-way, with free transfers from route-to-route. Only coins and $1 bills accepted. Drivers can make change for up to $5 prior to 7:00 pm. Exact cash is required after that time. There is no free parking at the meeting venues, only limited metered parking nearby. The Mobile Meter app is a convenient way to pay, or you may call 217-207-3033 to pay by phone. Some meters have a time limit, so be sure to check the actual meter. Alternatively, Campus Parking sells day meter permits which can be used at University meters (denoted with a "Block I" sticker). These hang tags cost $12 and can be used for the full day. This event is intended to welcome back our women graduates, and there will be no registration fee for this event. We will request that you to register so that we are able to plan spaces and events accordingly. Please check back in April 2019 for a link to the registration site.